The lights are mounted on Fort Street, Cayon Street, Victoria Road, the Bay Road, as well as Wellington Road and East Independence Square Street. Liburd stated up until then the road markings are being completed and the requisite legal amendments have been made to govern motorists and pedestrians, for when the lights become fully operational. 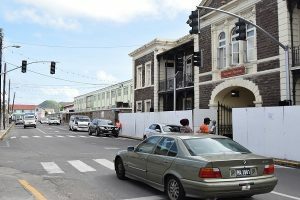 The current traffic lights mounted around Basseterre are only phase one of the project which cost an estimated USD$572,000. Victoria Road from Cayon Street. West Independence Square St. from Cayon St.
Wellington Road from Pond Road. Cayon Street from New Street. Stainforth St. from Pond Road. Bay Road from West Square St.
Burt Street from Cayon St.
Hart Street from Cayon Street. It was also indicated that parking has been restricted along portions of the streets leading to the signalized junctions. Pedestrians are required to cross the road in the vicinity of the Traffic Lights, only on pedestrian crossings, and only when given the signal to cross. Failure by a pedestrian to cross on the cross walk or only when signalled to cross, can result in bodily injury from passing vehicles, prosecution, with fines up to $500.00. They also implored members of the general public to familiarize themselves with the rules governing the use of the signal lights.